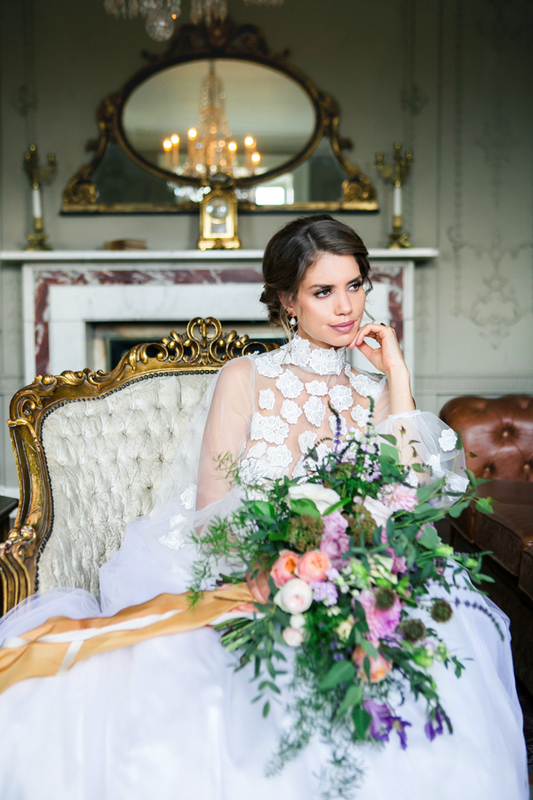 As if stepping straight from a chivalric romance novel, The Lady of the Manor encompasses female power, confidence and passion. 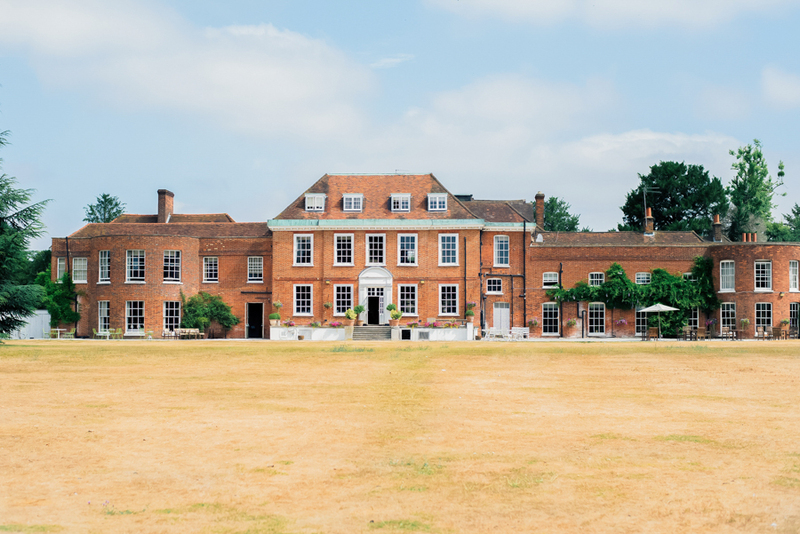 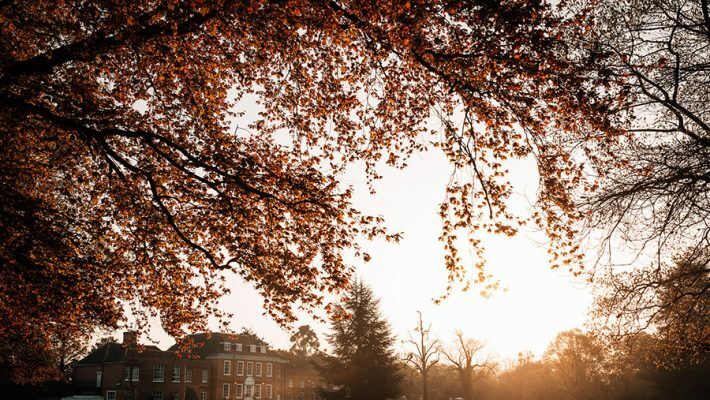 She stands strong, alone, as she resides by the lake in the grounds of an English stately manor. 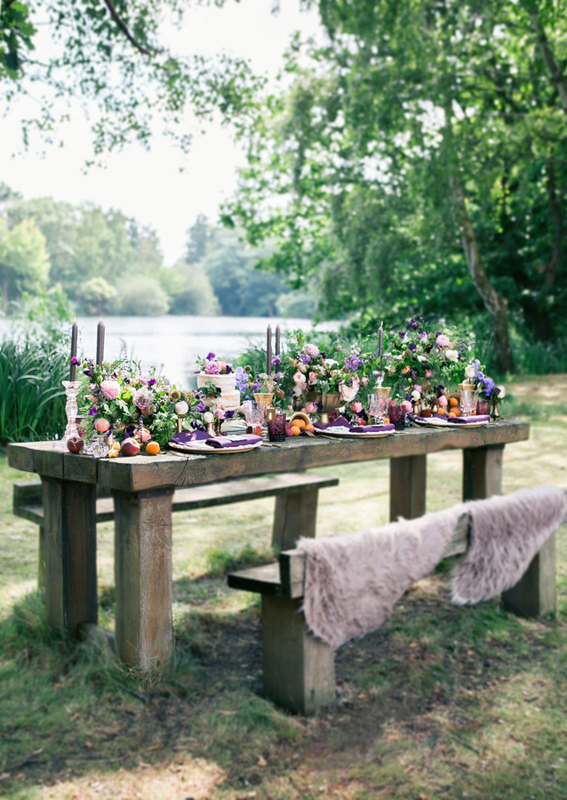 Set in front of the lake is an enchanting feast upon a table adorned with rich flowers, fruit and cake. 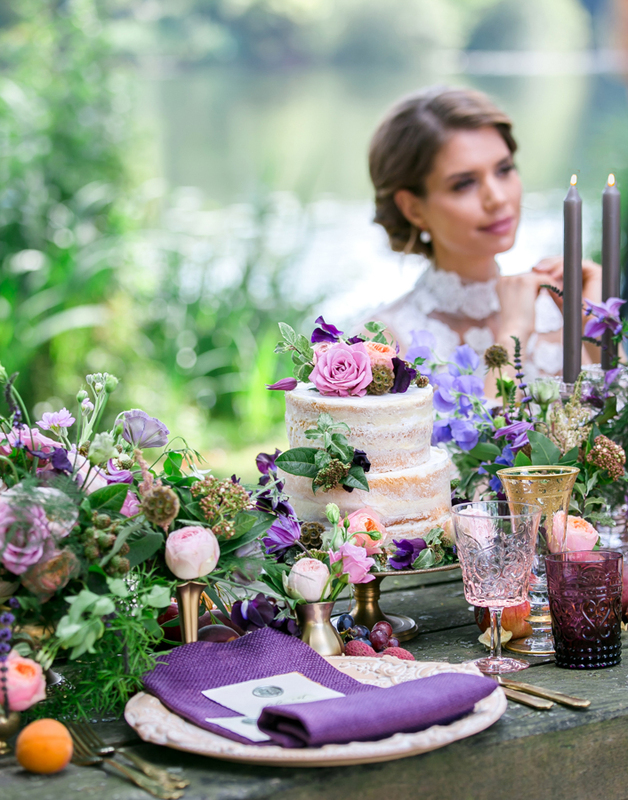 The abundance of deep purple florals and gold crockery reflect the luxury and mystery of this bride as she sits in wistful wonder of her true love. 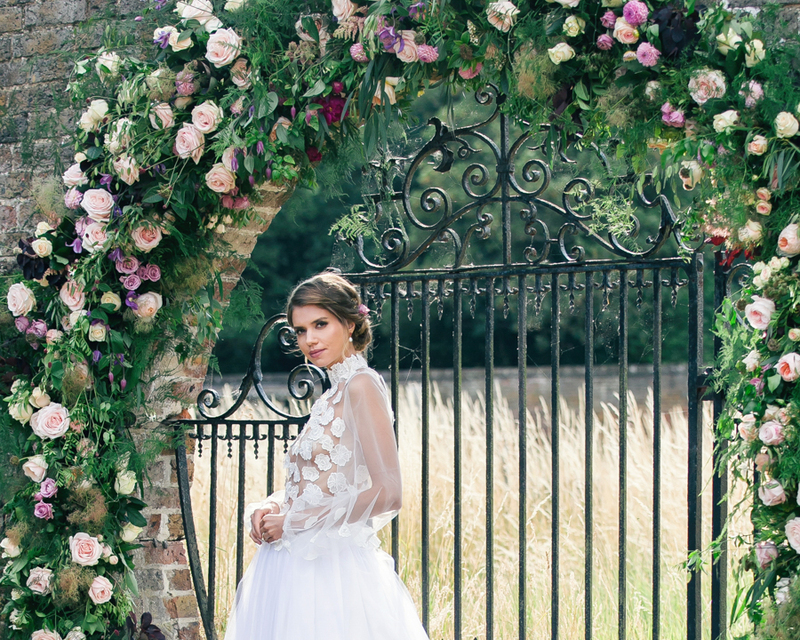 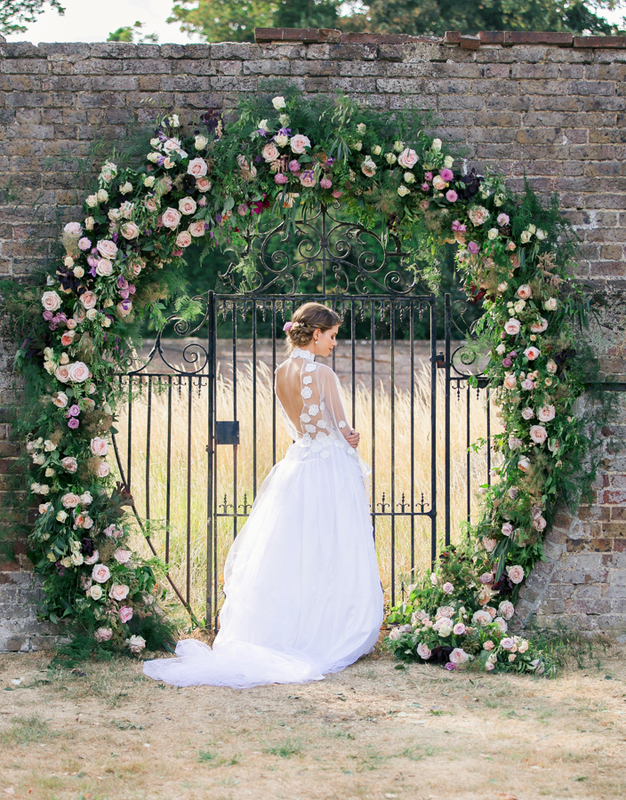 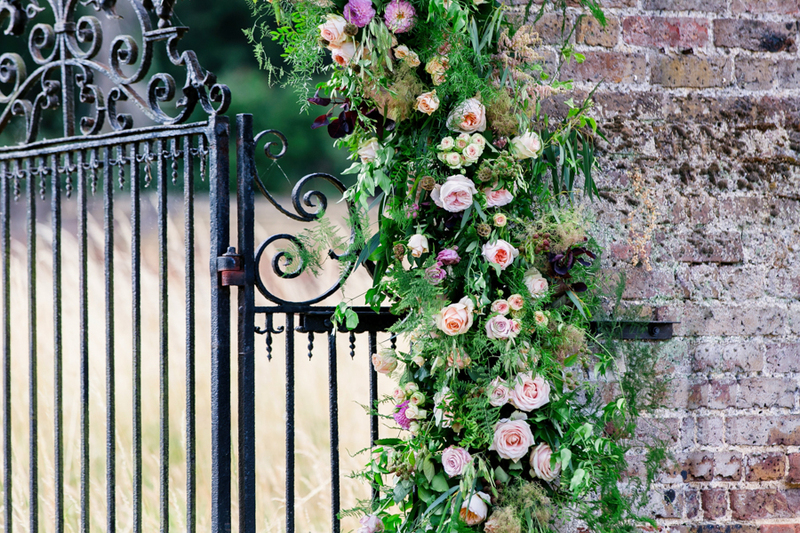 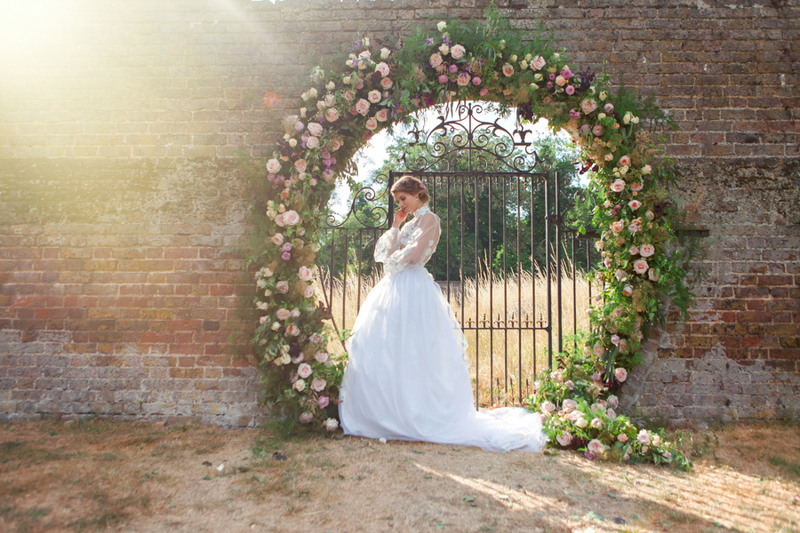 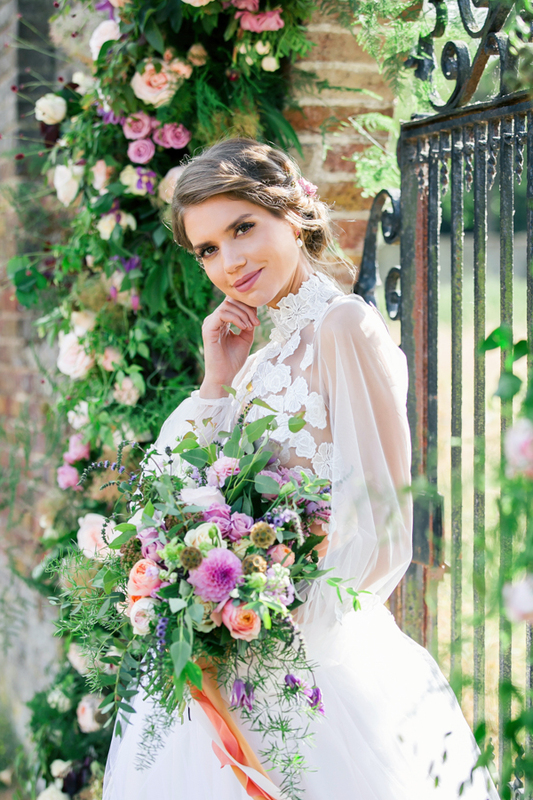 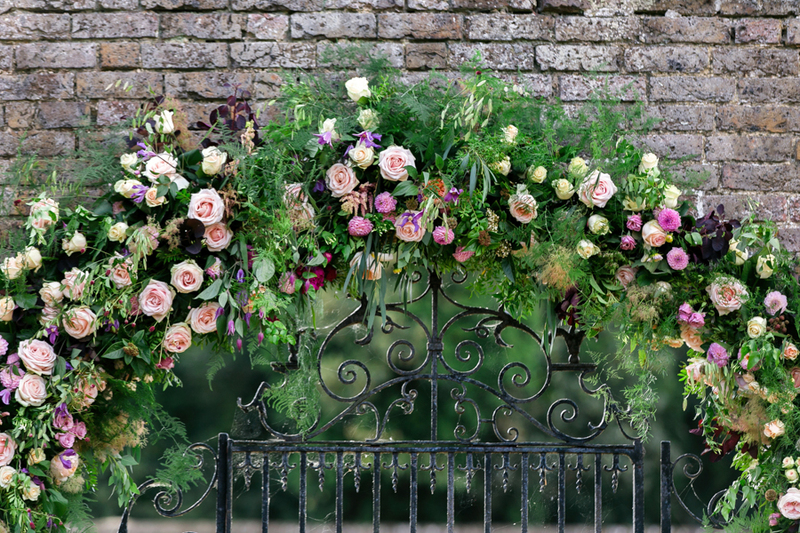 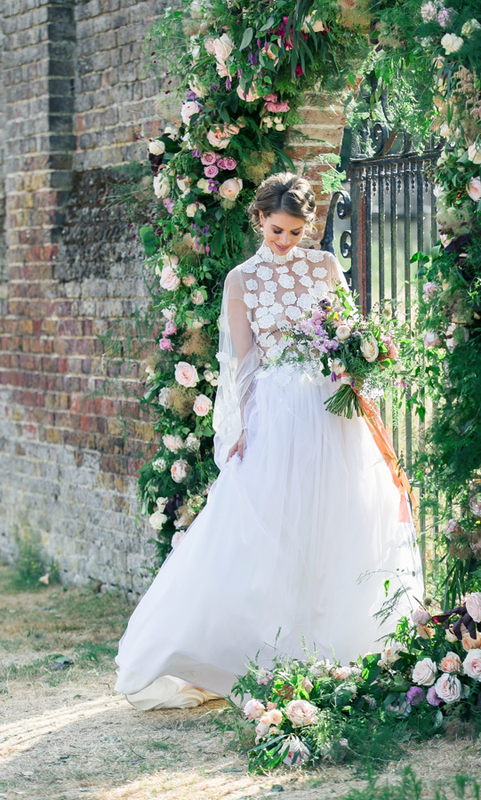 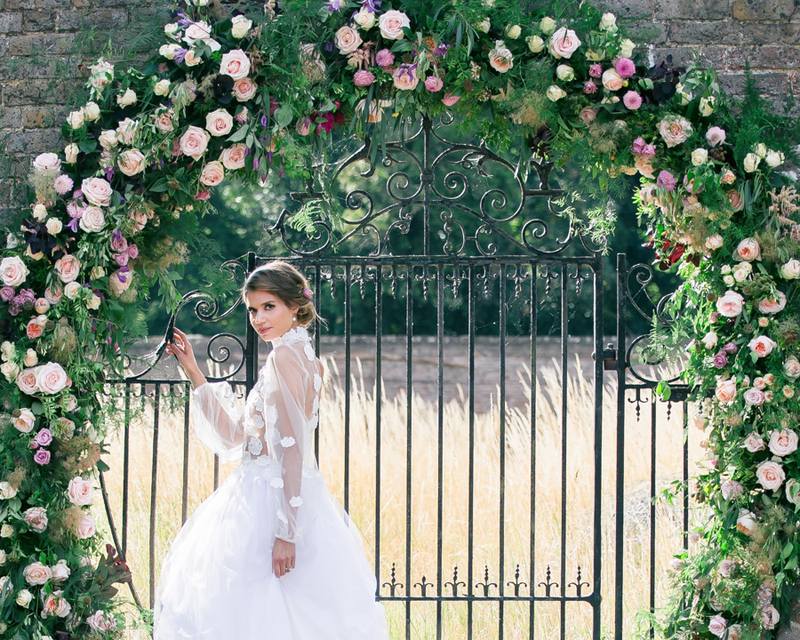 A gated archway adorned with exquisite roses and ferns frames the Lady of the Manor as she stands poised in the sunlight in her wedding gown. 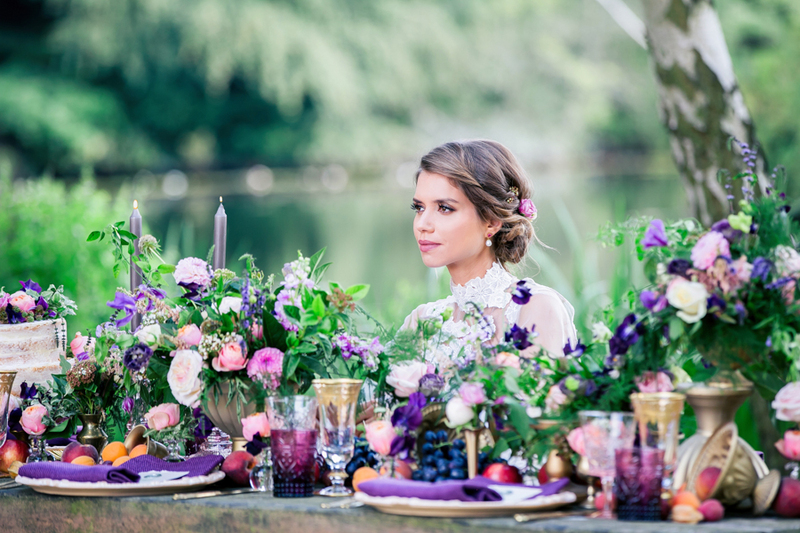 The lake was beautifully calm providing a luscious green backdrop for the table setting whilst the archway provided a captivating frame for the bride and the perfect setting for the stunning flower installation. 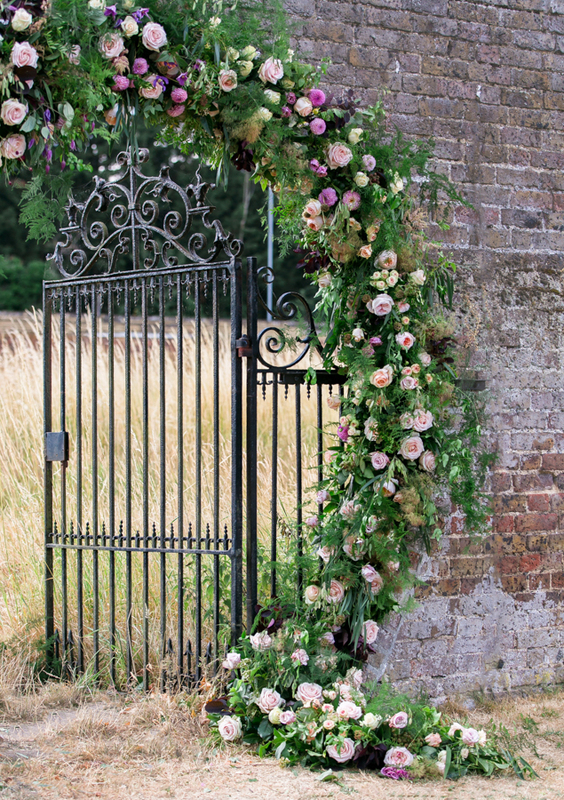 This final archway scene stretches the imagination from the restrictions that wedding flowers are just for the bouquets and centrepieces. 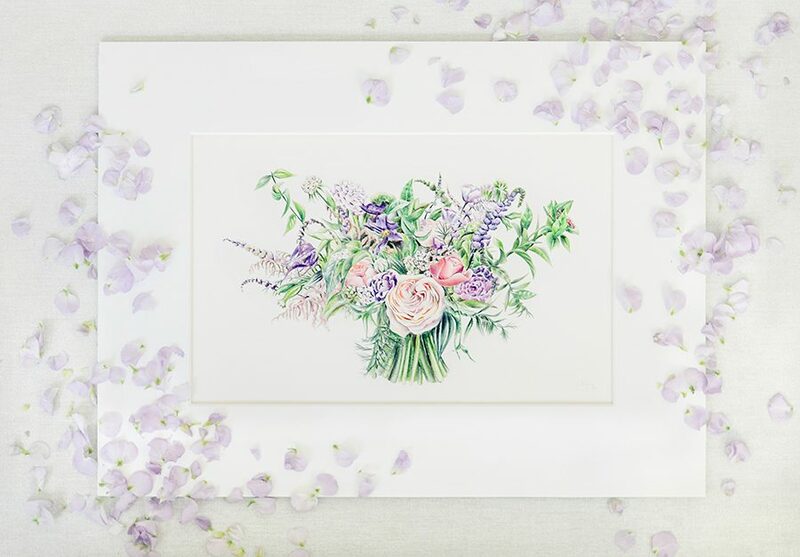 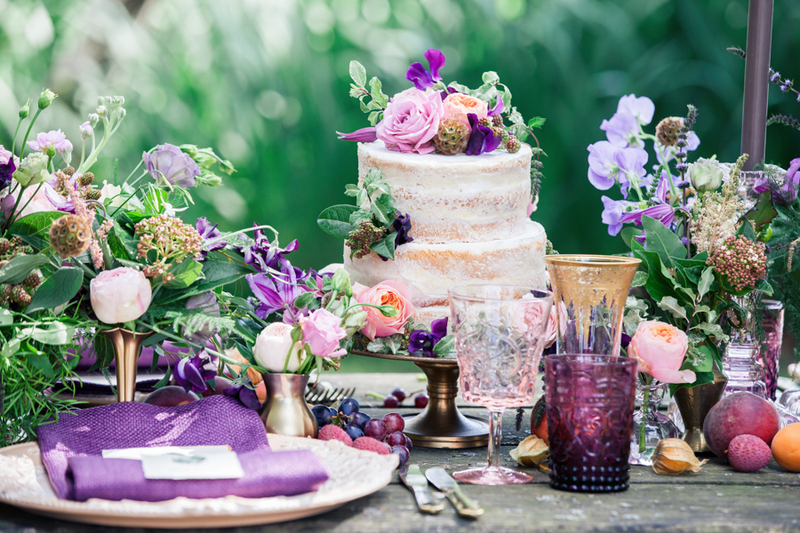 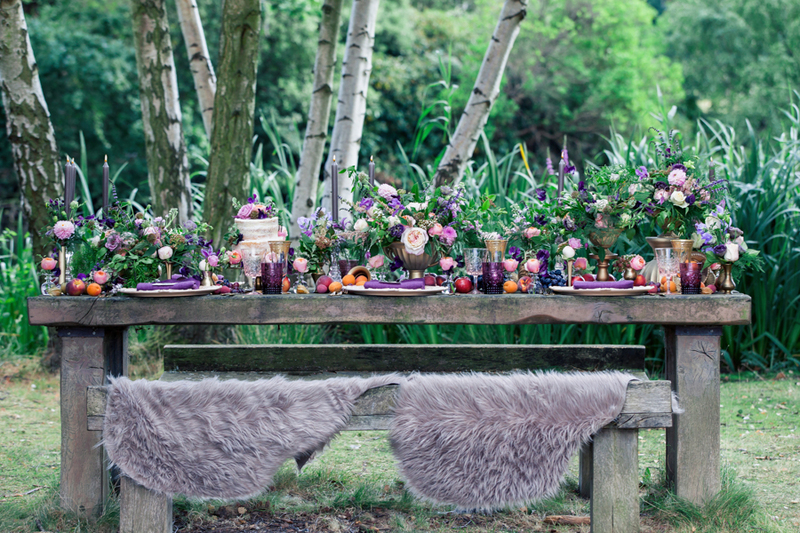 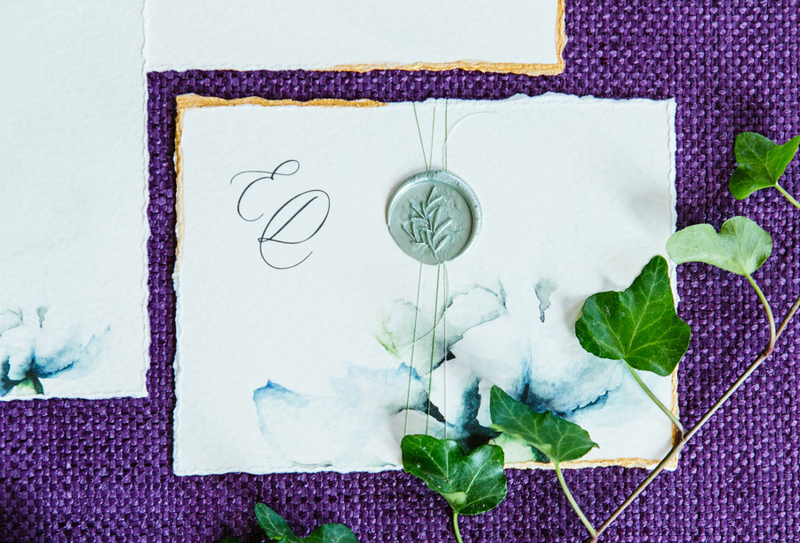 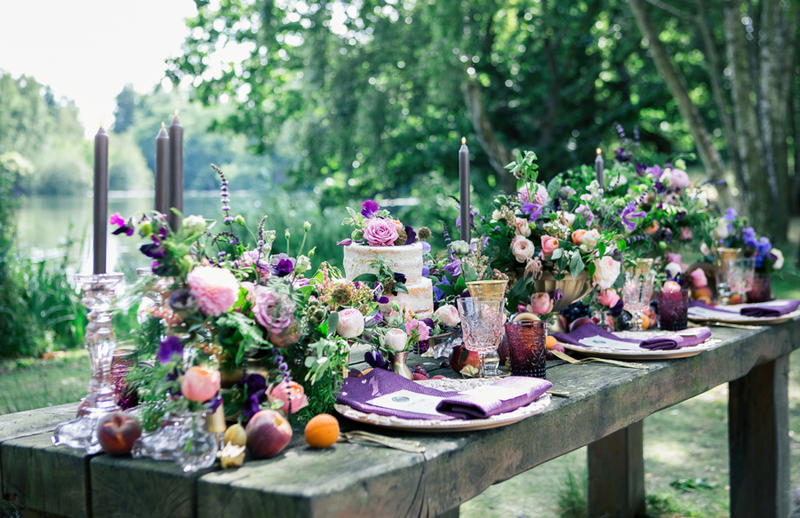 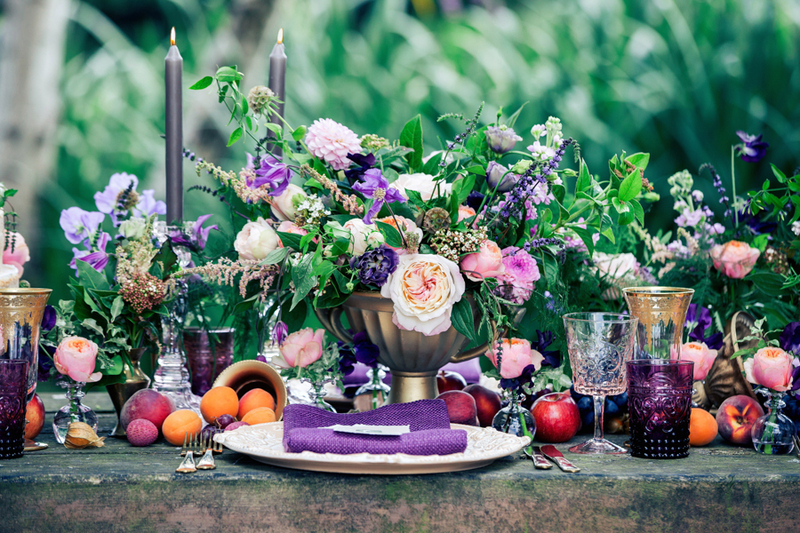 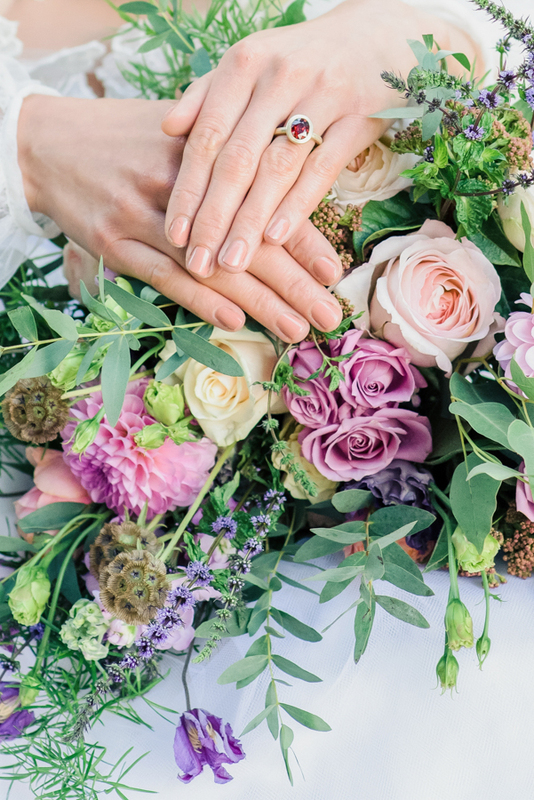 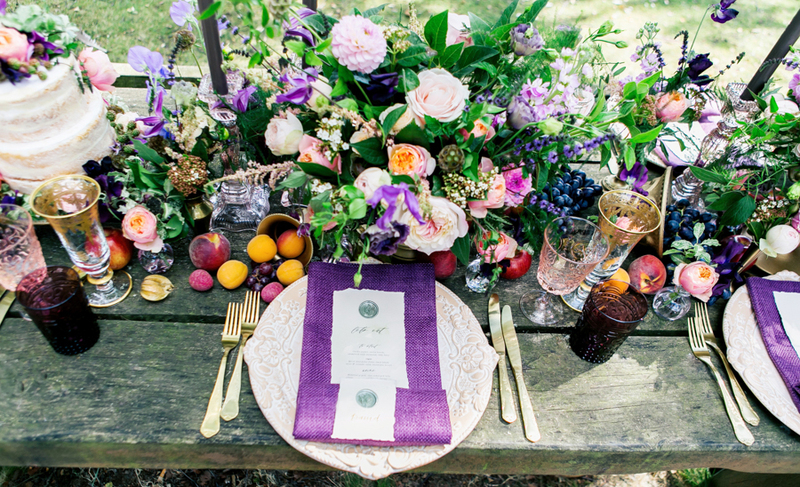 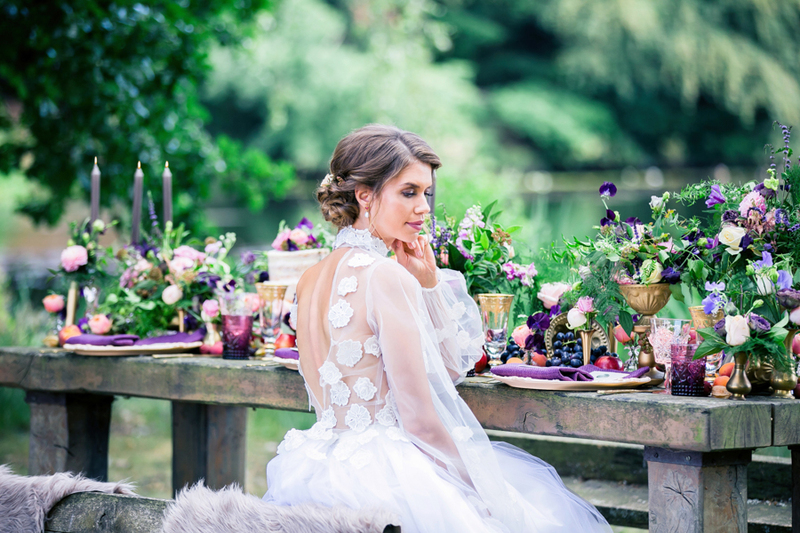 The tablescape oozes opulence and enchantment but the flowers transform this shoot into something truly special by including dynamic colours in blooms as well as through thistles and greenery. 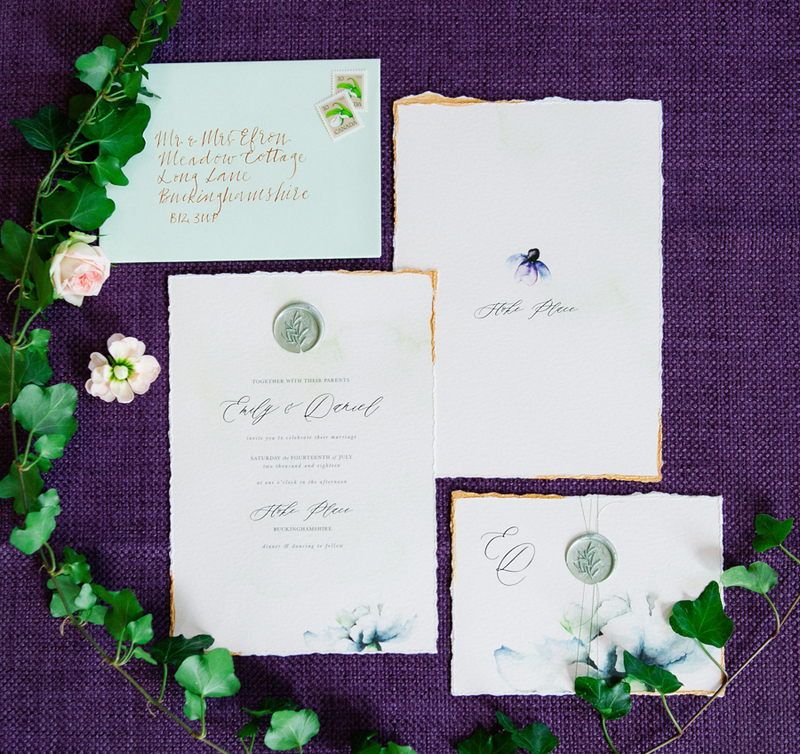 The theme, scheme and style is clear and consistent. 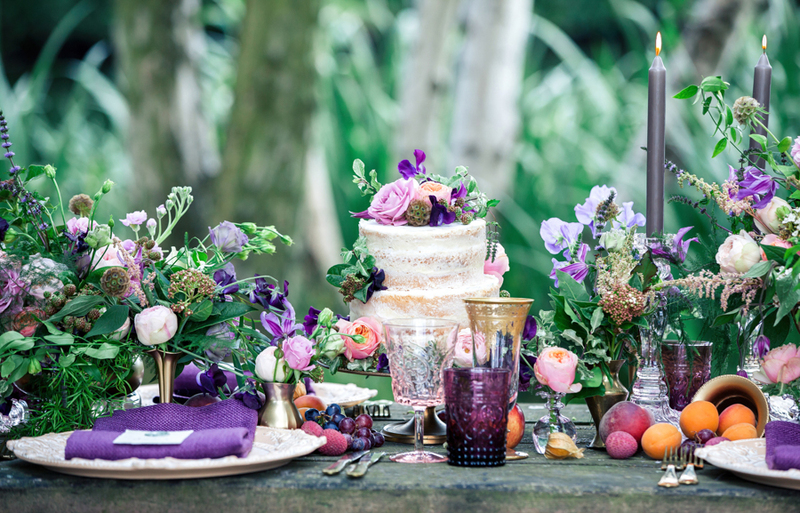 Great care was taken to ensure all elements of the shoot tied together perfectly, from matching the colours of the linen with the flowers, edging the stationery with the same gold as the crockery, the height of the semi-naked cake complementing the other table arrangements, to the style, shape and colour of the jewellery. 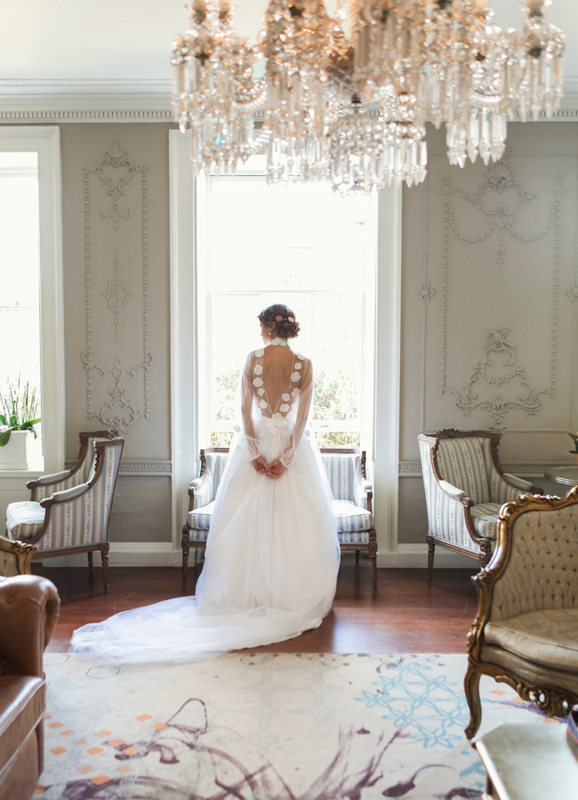 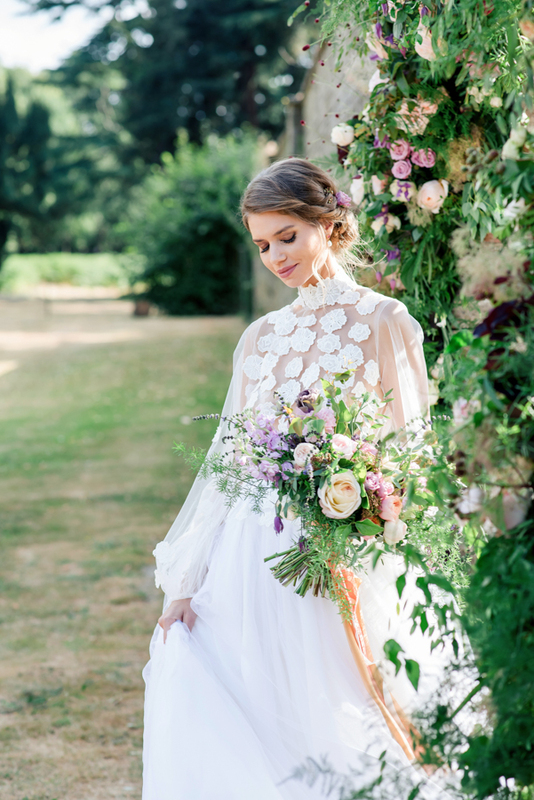 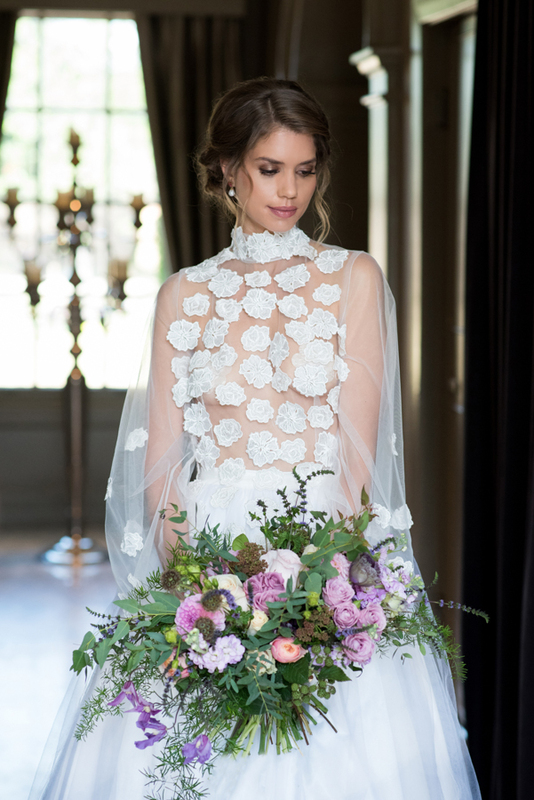 The dress created an opulent look to suit the enchanting home and Lady of the Manor feel. 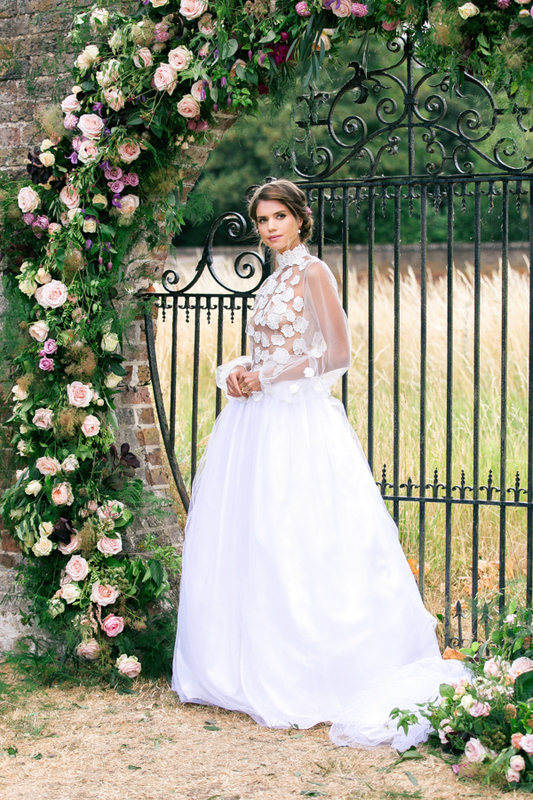 The full skirt with the high neck bridal top with an open back. 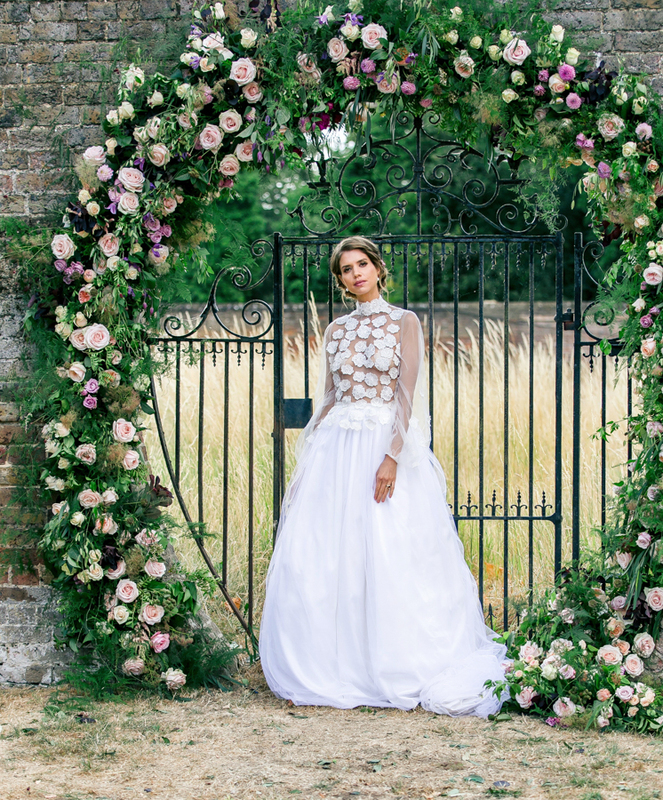 It was designed specifically for the shoot with the floral motifs hand sewn to reflect the outdoor location and strong floral presence.